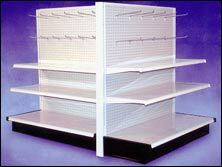 Store fixture shelving is ideal for storage and display of items in a retail setting. 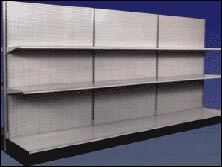 Retail shelving is more pleasing to look at than industrial steel shelving. Whether it is is a small convenience store or large department store, we can provide a floor plan to maximize your floor space. Calculating the number of sections that you need is simple. Start each row with a "starter" section and then add the desired number of "add-on" sections. Lastly, decide how many shelves are needed.